WIP: Your Work-In-Progress Management Solution. Copyright © 2001-2017 by QVAuctor Ltd. All Rights Reserved. No part of the Computer Software or of this Document may be reproduced or transmitted in any form or by any means, electronic or mechanical, including photocopying, recording, or by any information storage and retrieval system, without permission in writing from ebiexperts. The information in this document is subject to change without notice. If you find any problem with this documentation, please report it to ebiexperts in writing at support@ebiexperts.com. ebiexperts does not guarantee that this document is without errors. The copyrighted products, product concepts, designs and design methods contained or described in this work are confidential. This work, either in whole or in part, may not be copied, reproduced or disclosed to others or used for purposes other than that for which it is supplied, with-out the prior written consent of QVAuctor, or if any part hereof is furnished by virtue of a con-tract with a third party, as expressly authorised under that contract. Under international copyright laws, neither the documentation nor the software may be copied, photocopied, reproduced, translated or reduced to any electronic medium or machine-readable form, in whole or in part, without the prior written permission of QVAuctor Limited, except in the manner described in the software agreement. Microsoft, MS-DOS, Windows, Windows NT, Windows 2000, Windows 2003, Windows XP, Windows Vista, SQL Server, FoxPro, Excel, Access, MS Query, Visual Basic Logo and other names of Microsoft products referenced herein are either registered trademarks or trademarks of Microsoft Corporation in the United States and/or other countries. ORACLE and SQL*Net are trademarks of Oracle Corporation. SAP®, Lumira, Webi, Business Objects logo, and WebIntelligence, Business Objects, Crystal Reports and other SAP® Products are trademarks of SAP Corporation. Although QVAuctor Ltd. makes every effort to ensure that this information is accurate, QVAuctor LTD. will not be liable for any errors or omission of facts contained herein. QVAuctor reserves the right to modify specifications cited in this document without prior notice. All users are required to log into the system. A username and password is required for login. The login mode depends of the Plugin you are login against, for Qlik, login can be achieved by entering a WIP assigned user or WindowsAD integrated user authentication which would be integrated to your existing active director or LDAP directory. For Plugins like SAP then all SAP Analytics login modes will be available. Please contact your system administrator should you have a license assigned and your login is not working or request access via the login page. Users can request access to the WIP application by filling out the “Request Access” form. In the Login Screen click on “Request Access” button to open the form. Note: The user is not able to set up User Rights as only an Admin Use can set up rights for a user. Fill out all the required fields in the user access request form and submit the form. The password to be utilised. A brief description about the User. It would be good to inform the Admin user, who will approve your access application of who you are and what your role is within the organisation. When you log in as a developer you will be requested to select both a product as well as a Workspace. A workspace will define where your files will go when you check your applications in/out. 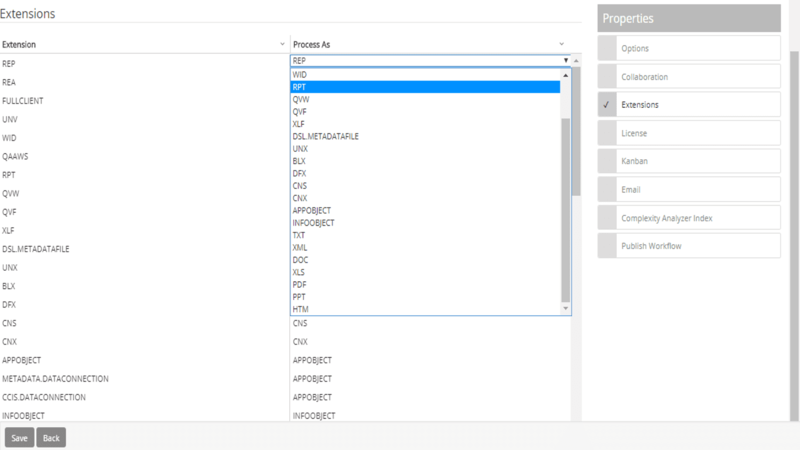 When you select a product such as Qlik Sense or QlikView the Workspace you are able to select will filter based on your access rights to such workspace so if you don’t have the rights to access a workspace it will not be on the list to select. Should you require access to a workspace which is not on the list please contact your administrator. The following section will define the menu categories and sub sections to the categories provided by clicking on the menu icon. The Kanban board is a central management board for all agile development of issues requested by both developers and business users. The objective of the Kanban board is to ensure requestors, and interested stakeholders, of issues thus development work, are in sync with the developer performing the work. The Kanban board and issue properties such as tasks, comments and notifications ensure development and collaboration between development requestors and developers are managed efficiently. The Kanban board structure is both vertical and horizontal. Horizontal movement across the board follows a process of work that takes issues from your To-Do across the board to Done statement. Horizontal movements can be both right and left so issues can move from In-Process state to On-Hold state based on waiting periods and so forth. Vertical movement across the Kanban board moves issues from the DEV environment as releases to QA/UAT environment and publishing files from the QA/UAT environment to the PRD environment. The Kanban board provides integrated issue migration actions that will perform actions on your issues when they are dropped into the specific area in the Kanban. Kanban filters enable the user to quickly cut through the Kanban board and concentrate only on their own issues, or issues specifically aimed at a certain business user of by issue type. 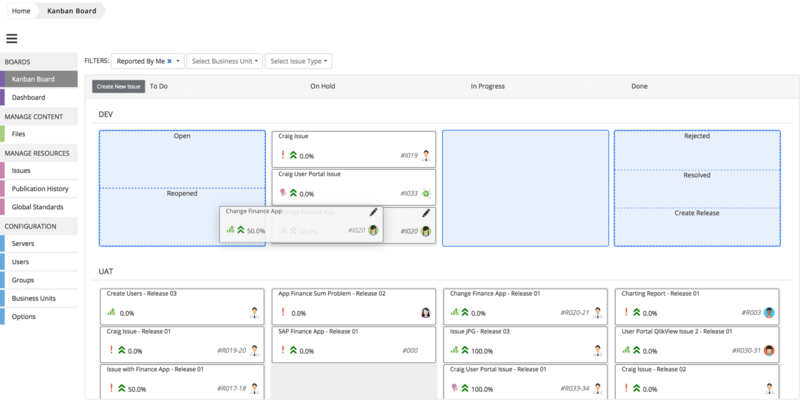 You can filter by clicking on the Select Business Unit dropdown and selecting a Business Unit, the Kanban board will filter all the selected business unit’s issues on the board. 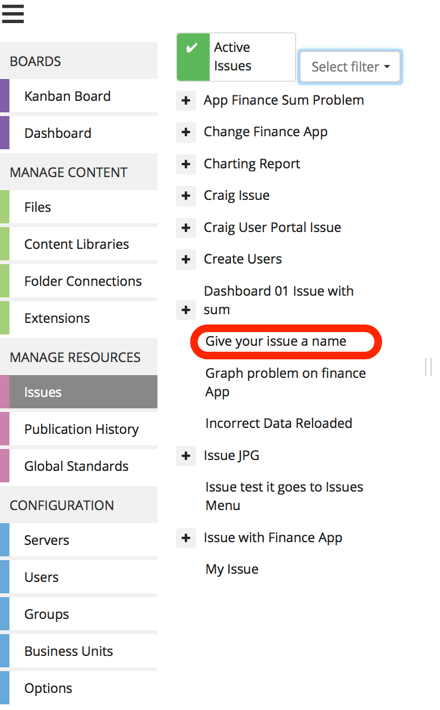 You can filter by clicking on the Issue Type dropdown and selecting an issue type, the Kanban board will filter all the selected Issue Type issues on the board. When you have used a filter, the x will appear on the dropdown list, you can cancel your filter by clicking on the x. You can create a new issue by clicking on the Create New Issue button. This will bring up the issue form from which you can create you issue by filling in all the information. The WIP system enables users to create issues without requiring a license to access the system. Unlicensed users can create issues, but are unable to access, track and monitor, attach files and attachments, and collaborate with developers around the issue. Reporter is the person who has identified the issues with the file and wishes to have them corrected. It is recommended to enter your work email on the issue as the developer may have some questions and would then be able to reach you when required. Provide a suitable name for your issue. This will allow the developer to understand what your issue is about before going into the detailed description and tasks. An improvement would be requested when the user wishes to improve an existing feature, view, calculation or visualization object. A new feature request can be done for any new file creation requirements, or when something does not already exist within the files and you wish to add something new to the file. Provide a suitable description for your issue. It is recommended that you provide as much details as possible around the issue to ensure it is understood by the developer. Tasks are very important as they measure the total completion of the issue so all changes you wish to apply to the files should be listed as tasks. Tasks are closed by the developer as they are fixed. Users should be able to agree with the developer that the tasks are implemented correctly thus as a licensed user you are able to follow tasks completions which you will receive as notifications from the system. Subscribers are people you think would benefit from being informed about the issue and the processing of the issue. Subscribers are always licensed users within the system and as such will receive notifications around the issue i.e. as the issue is migrated across the Kanban board, or tasks are completed or comments are raised. Business units enable the administrators of the system to easily manage the resources available to perform work around issues. Business unit will filter the assignee list to make it easier for you to find the relevant people you wish to assign the issue to. Leave the issue ticked should you wish the issue to remain active. Active issues are placed on the Kanban board for processing. Tick the issue active box to inactive should you wish the issue to become inactive. Inactive issues are not visible on the Kanban board and will not be processed by admin and developers. Click the save button once you are satisfied with all the information you have provided around the issue. 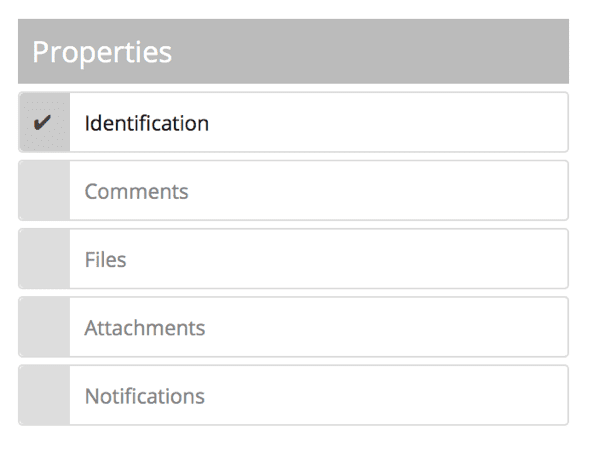 Once you have saved your issue you can now add additional content to your issue such as link you issue to a file, or add attachments such as specification requirements or project plans. The comments section will show all comments every added to the issue. You can add comments which will show on the issue and visible for the developer to review. You can add files to your issue. Clicking on the file selection dropdown list will provide you with a list of all files, you can type into the dropdown list to search for your file in the list and make it easier to find the file in question. You can only add one file at a time so perform this task multiple times should you wish to add additional files to the issue. You can add attachments to your issue. Attachments such as specification documentation, business plans, project plans, budget approvals and so forth are good supporting documentation for any issue and would ensure efficient processing of the issue. All notifications that have been sent around the issue will show here. Once you save your issue all changes will be updated to the issue. As a non-licensed user this is where your interaction with the issue on the system stops. You can communicate with the assigned developer via email for updates. Should you wish to track and monitor the implementation of your issue please contact your administrator for access to a user license. Our Kanban board enables you to drag and drop issues across the board and by doing so will affect the status of the issue or create a release of the issues or publish the issue linked file into a publication environment as set up by your administrators. Please Note: Moving an issue across the board means that notifications will be sent to the reporter and interested parties identified on the issue. The DEV environment is the Development environment where all files should be checked-out to when you wish to develop them further. The development environment generally would be a development node or stream in Qlik Sense or a shared development folder in QlikView. The development environment generally would not allow for business users to access it, but would purely be for developers to investigate, apply fixes and perform their own testing before they release a file to the business user for testing. In the Kanban board this method of work is supported enabling the developer to move his issue and associated file across the board based on his development process. Issues can move either left or right across the board and dropping them into certain statuses on the board will change the status of the issue accordingly. The To Do column provides two options when you drag your issue across the Kanban board. Dropping your issue into these highlighted areas called bands will change the status of the issue accordingly. Whenever a new issue is created it will be posted into the DEV stream with a status of Open. The reopen band change is used for issues that have been rejected or resolved before so that issues can be reopened subsequent to the decision being taken, and reopening the issue instead of creating a new issue means you can retain all historical changes and collaborations around the issue. The Done column provides three band options when you drag your issue across the Kanban board. Dropping your issue into these highlighted bands will change the status of the issue accordingly. The rejected band should be utilized for issues that have been rejected by either the developer, stakeholder and or business user. Resolved means that the issue has been resolved through a fix or it could not be replicated but the requestor has accepted that the issue can be resolved. Resolving the issue keeps the issue in the stream so you should deactivate the issue if you wish it to be removed from the board. When you drop your issue into the Create Release band the WIP system will create a release of the issue and place it into the UAT stream with an Open status. Creating a release is the only way to move your issue to the UAT stream, and that is as a release of the work that is now ready for testing by the user. The User Acceptance Testing (UAT) stream functions under the same columns of the Kanban board and provides for three drop options within the Done column. The user acceptance testing process is an iterative process between the developer and the user for testing the work that has been performed on the file. The developer will publish the file so that the testing user can access the file in the UAT/Test/Pre-PRD publication environment and will move the release across the UAT stream as the testing commences. The publish band enables the developer to publish the release into the production (PRD) environment. Dropping the release into Publish will bring up the publication view which enables the user to publish the file to an environment. The Production (PRD) stream functions under the same columns of the Kanban board and provides for three drop options within the Done column. The dashboard provides a complete view of the user’s activity across the system. This view presents a list of users that have requested the admin user to publish applications / files for them. This would mean that the user either didn’t have the rights to publish to a certain environment or the user’s file does not meet the complexity threshold of a certain environment. The files section is where you manage all your files, both in the WIP repository as well as access files via the Application Protocol Interface (API) integrated to your product-based files and repositories. You can access the WIP repository files from the hierarchical folder section as per the image provided. You can browse your files in each folder and see them based on their checked-in/out status or you can search using the column based provided search fields. Selecting the all files button will show all the files in the repository within the files list pane. Clicking on the More button opens up the various options you have under the more option. A Root folder is the highest-level folder you are able to create. 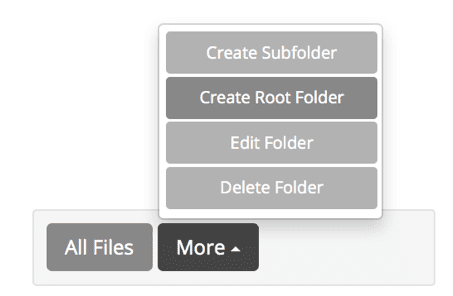 You can create many levels of subfolder structures underneath a root folder. Subfolders are created into a sub hierarchy of the existing folder you are in. To create a subfolder, click on the folder you wish to have as the subfolder’s parent folder, click on more and create subfolder. This will create a subfolder underneath the current folder you are currently accessing. Will enable you to edit the folder you have currently selected, so select a folder and click on the Edit Folder button to edit the folder. The edit folder option will enable you to change the folder name and assign different security groups to the folder level. Creating a subfolder will require that you provide both a name and assign group level security to the folder you are creating. Once you have saved your folder’s name you can assign group level rights to your folder by clicking on Security tab. You can both add and remove groups from a folder by clicking the respective buttons and accepting the action. You can assign, and affect security after the fact, group level security to a sub hierarchy by ticking the Reset permissions on all children and enable propagation. This means that changing the security after you have set it will propagate the changes to all the subfolders of the folder you are currently editing. Click on a folder and click on edit folder to edit the folder you are currently in. Editing the folder will enable you to change the folder name and group level security access to the folder. Click on a folder and click delete folder in order to delete a folder. Please Note: Deleting a folder will also delete all the subfolders to that folder. You can work with a file by clicking on the file and highlighting the file within the file list. Please note you can select multiple files at the same time (grey background) so should you wish to check out / in or publish multiple files you can click on multiples files and then select the action you wish to apply. Selecting a file and clicking on the Edit button will bring up the selected file’s properties view. The main window will provide the Identification information and check-out information about the file. Please note: The specific file version properties provides the same action buttons you have on a file level so every action you perform will be performed on that specific version of a file not master file that is managed in the WIP repository. See Edit File section for a description of the action buttons. 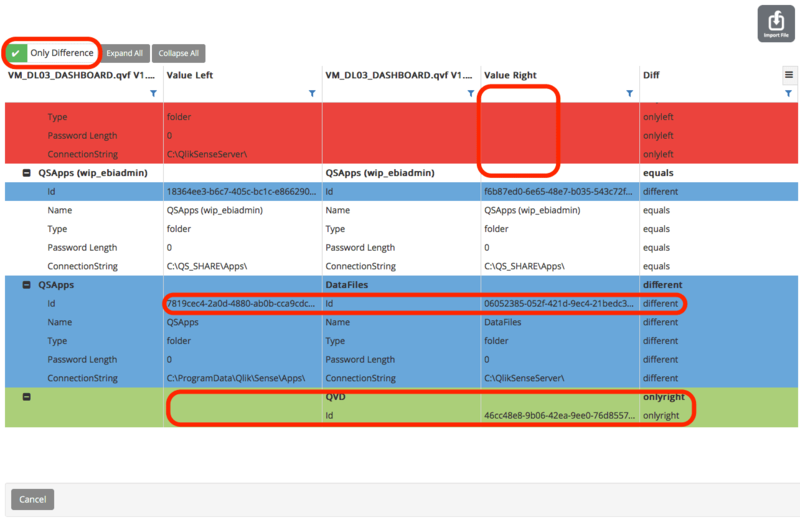 As an example: Clicking on VM_DL03_DASHBOARD.qvf in the image below will take me to the impact analysis view of where this .qvf file gets it’s data and it’s data’s source view. In this view we can now see that Sales orders.qvd is actually generated from sales orders.xls which loads the VM_DL01_QVDGEN.qvf which is a .qvd generator which then generates the sales orders.qvd file. Publication History of a file will show a view of every version of the file and where that version which environment that version was published into. You can select the Environment you wish to view from the provided dropdown list of environments. 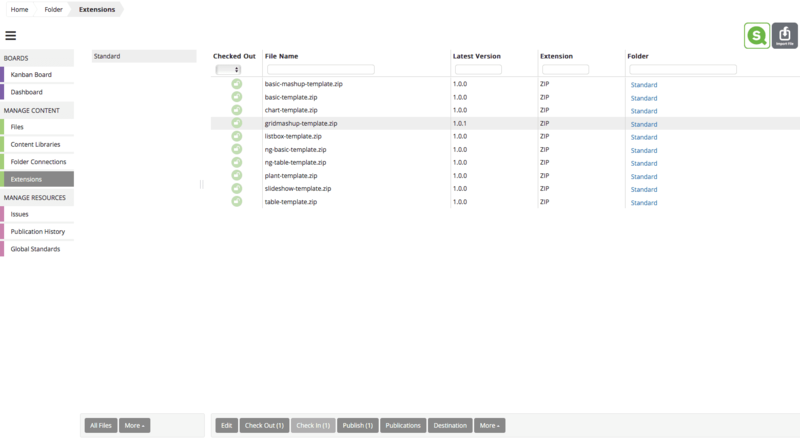 Changing the environment from the dropdown list will show that file’s publication history for the selected environment. You can select a file from the list and click on the Rollback button which will rollback the file to the previous version of the file that was published into that specific environment. This feature is very handy should you publish a file into an environment and the file is not working anymore so some or other reason. You can rollback to the previous working version of the file while you fix the problem in the latest version. File level variables enable the user to assign variables to the file or link globally defined variables to the file, when a file is checked-out or published to an environment. You can Link global folder connections to the file by selecting the Link button. 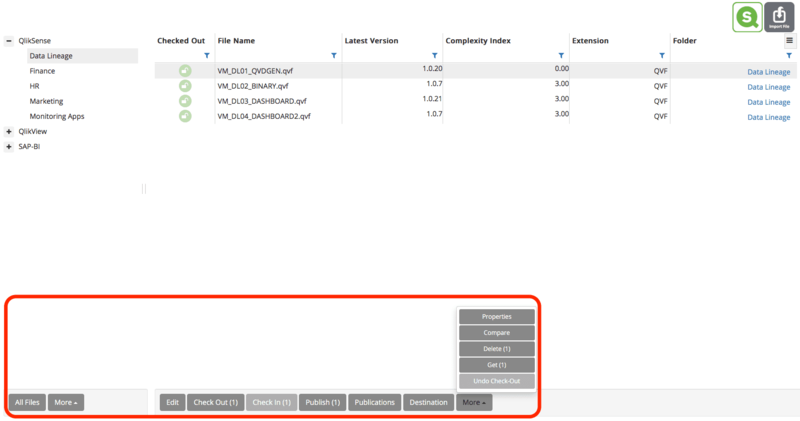 You can review the complexity analysis across different file versions within the complexity analysis view on a file level. The complexity analysis provides you with a view of all the different categories that influence the complexity of a file and the score, percentage or value of the specific category for the file. This view is useful to see when you are in the process of optimizing your application or you wish to see why an application suddenly does not perform well within an environment. Selecting one or multiple files and clicking on the Publish button will take you to the file publication form. The default form will show you the File Name, publish comment, publication type, publication environment and reload automatically options. The publish comment is a required field and adds information to the publication for other users to better understand what has changed in the file published from the previous file published. ForApproval: Does not publish the file but sends a request to the administrator users to publish the file. 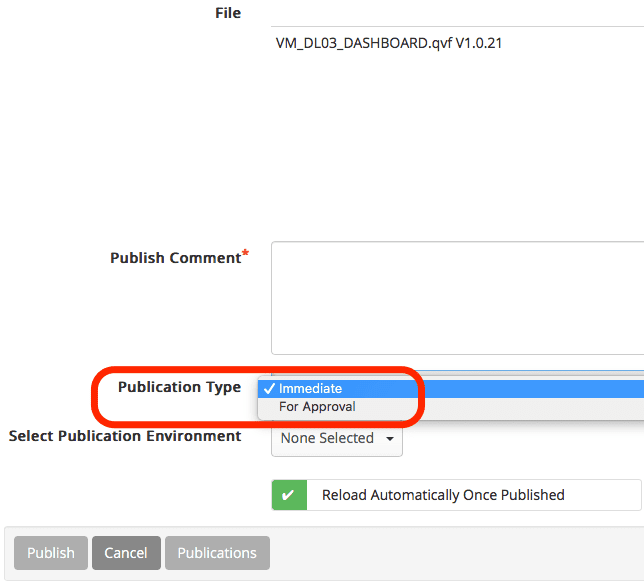 Note that is you have only “publish for approval” right on one of the selected environments then you will only be able to publish for approval, not immediately. 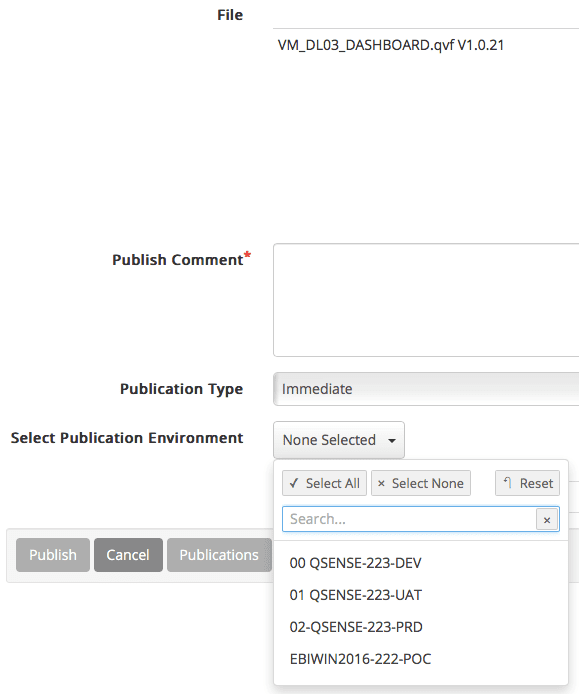 Clicking on the select publication environment will bring up all the possible environments the user is able to publish into. Environment Complexity: of the file compared to the index threshold set for that environment and will return a pass or fail view per environment selected. This will help the user identify whether his file will be allowed to be published into the environment or not. Should you have a file that fails the environment complexity analysis threshold WIP will enquire whether you wish to request dispensation from the Administrator users in order to publish the file. This means that the request will go to Admin users and they will be able to publish the file should they approve the publication of the file to the specific environment. 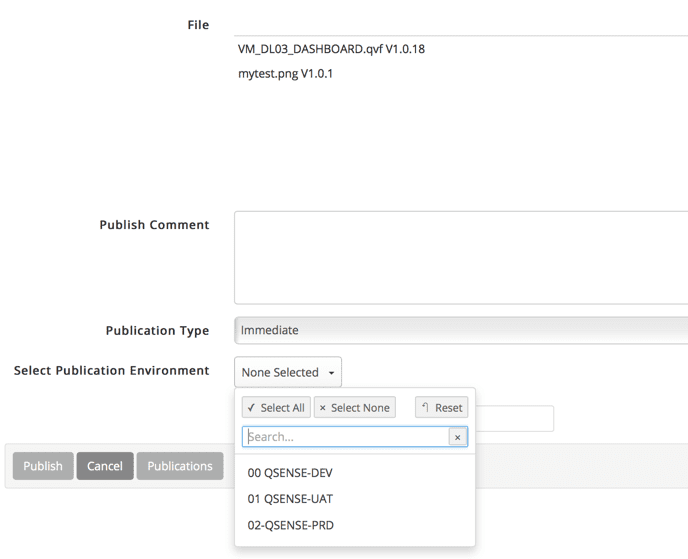 Should you meet all the publication requirements your file will now be published into the environment(s) selected and can be automatically reloaded once published into the environment. The publications view of the file will show you the latest version of the file across all environments as well as who published it and what the publication path for the file within that environment is i.e. which stream or folder it is published to in that environment. 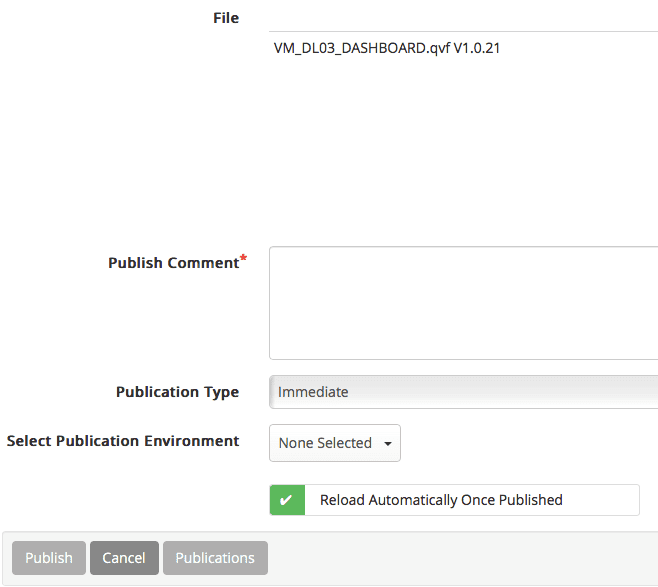 The publications view also provides a button that will take you to the Rollback view in the publication history of the file, should you wish to rollback the file within a certain environment. The destinations view provides a view of the various destinations set of the file when it is checked out or published across the different environments. Clicking on the file properties button will bring up the standard file properties view and alternative Version Content view. The Version Content view provides you with a hierarchical structure view and values of all the metadata about your file. You can expand all or collapse all be clicking on the buttons provided. You can undo a checkout should you wish to ignore any changes made to the file within the checked-out stream/folder. You can access the files within your product repository or file structures by browsing the product Application Protocol Interface (API) access button. The API access will change based on the product you have logged into i.e. logging into Qlik Sense and a Qlik Sense workspace will give you the Qlik Sense API access option. Please Note: The product icon you used to access the API will turn grey with a x cross on it. You can click on this icon to close the API browsing window. You can browse your product files and drag/drop them into the WIP repository folder of your choice. Performing this action will automatically check the file into the WIP repository. While you have the API list of files open, click on the WIP repository folder you wish your file to be checked into, click on the Check-In button. 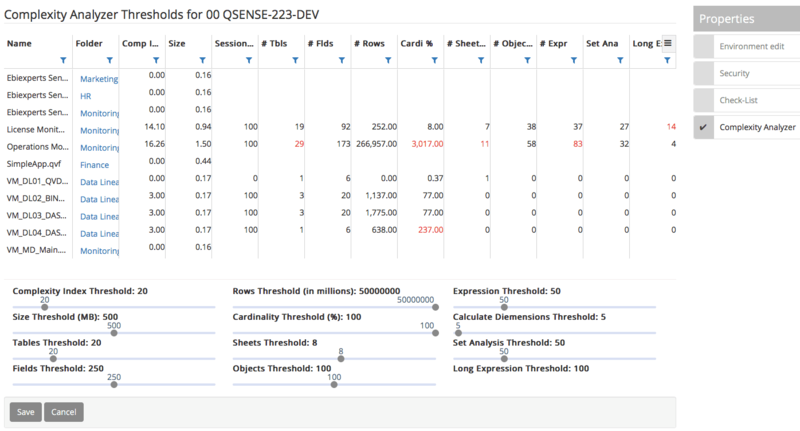 The content libraries are integrated to the Qlik Sense API and will connect to the Qlik Sense Content libraries stream. Content library files can be managed in the same way as all other files are managed through check-in/out and publication processes. To browse your Qlik server click on the QlikView / Qlik Sense Icons or access other files through by clicking on the Import File icon. You have two types of connections in Qlik. Connections insure that your connections to your various data sources always work within the environment you are publishing your applications into. WIP will automatically update the connection based on the environment published. Data connections are set up on an application level and can be various types of connections. Data connections are set up on an application level so you can connect to many different data stores and data types via your application. WIP also manages your data connections on the file level thus you can access your file data connections from the file properties. Additionally, to file level connections you can also set up global connections that will be accessible for all files. Folder connections are utilized for your “LIB” folder connection content. 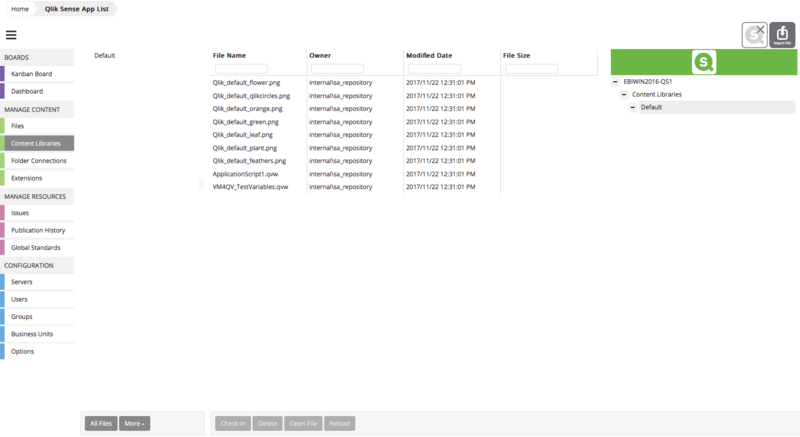 You can manage the files in your folder library connection within WIP and any updates on the files will then be migrated to your server as published from time to time. 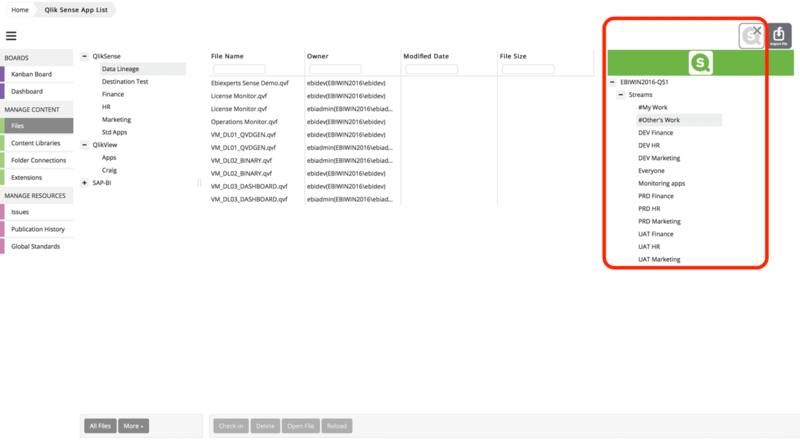 Folder connections are integrated to your Qlik Connections via the API. 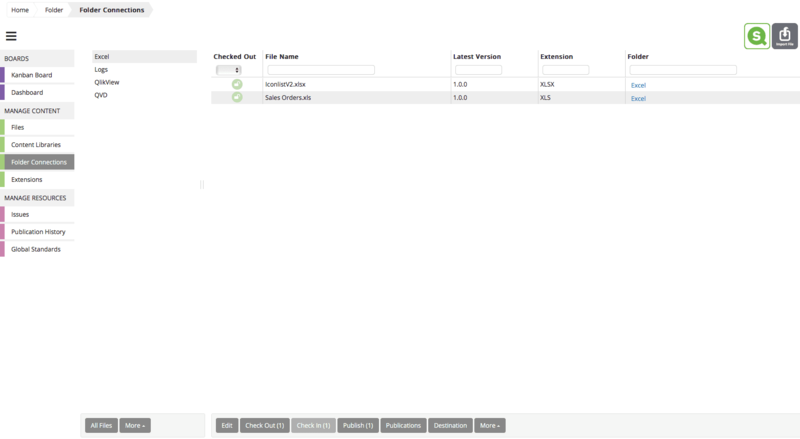 When you connect to your Qlik server it will automatically display all your content in your Qlik Connections via the API connection to your Qlik Server. You can now drag/drop your various connections, includes, files etc. into the WIP repository folder of choice. Qlik supports many different types of extensions. Extensions can be several different things: A widget library, a custom theme, or a visualization extension to visualized data such as an interactive map. WIP integrates to your Qlik server and accesses your extension libraries. You can drag/drop extensions into the WIP repository and manage them accordingly. WIP will manage your extensions in the same way that it manages a file. The issues list provides a list of all active issues by default. Active issues are still work in progress thus visible on the Kanban board. Deactivating an issue will remove it from both the Kanban board as well as the active issue list. Ticking the Active Issues box will show you all the deactivated issues. These are issues that have been completed and should not reflect on the Kanban anymore. The filter will still apply on the deactivated issues list. If you have not added any files or wish to add some additional files to your issues you are able to browse the WIP repository folder, stream, connections, content libraries and so forth. You can browse the files by clicking on the WIP product logo as indicated in the image, and drag/drop the files into the issue or release you wish them to be added to. Linking files to issues ensure they are published accordingly when you are ready for publication. The publication history section enables you to search for publications based on a date range which can be set by selecting the From Date and To Date calendar sections and selecting the date range. Additionally you can search your publication history by creation date, publish by, publication type, publication status, description, publication date, and based on the type command line used. Selecting a publication will show the environment, files, published version, previous version, publication status, publication folder path, publication errors for that specific publication. Clicking on the Rollback Publication button will rollback the total publication to the previous version of all the files within the publication. Clicking on the Rollback Version button will rollback the file you have selected to the previous version of that file within the published environment. 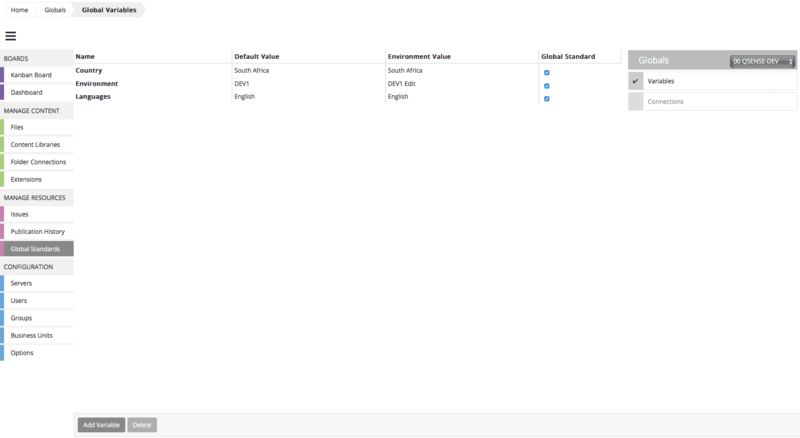 Global Variables and Global Connections can be linked to any Qlik application in your WIP repository. Common variables and connections used by your applications should be created here, as a central global standards library, for quick access from any files. WIP enables you to create different variables and connections where the default value will be the same but different values will exist based on the environment you publish your standards into. You will thus have a central place where you can manage all your global standards. To automatically change the value of a Variable or Connection when publishing to an environment, first select the Environments filter on the right. Note the Default Value will be replicated in the Environment Value no matter which environment you select. You need to edit the Environment Value with the Environments filter applied. Your global standards variables and connections values will automatically be applied when linked to a file. To add a variable, click on the “Add Variable” button. Admin users are able to create, edit and delete servers from the WIP repository. 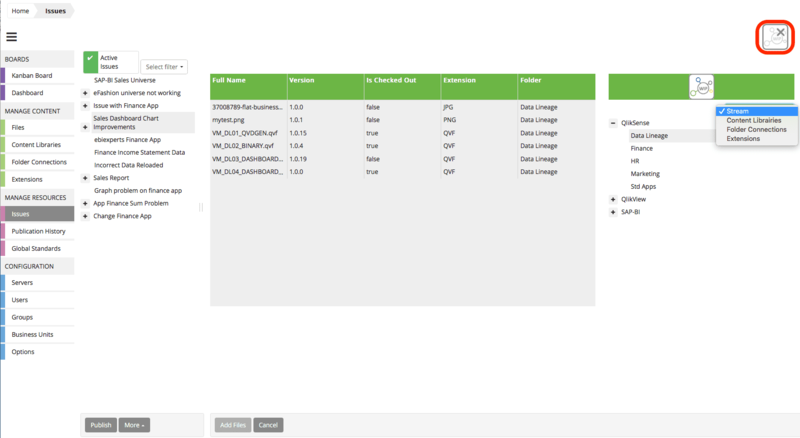 Server setup are where the admin users will configure the setup and connection to the QlikView and Qlik Sense servers. If you are logged into Qlik Sense you will attain all the Qlik Sense configuration options and vice versa for QlikView and SAP Analytics. Please review the Administration Guide for a detailed view on server configurations. You are able to access a specific environment from the servers option and by double clicking on a specific server and selecting the Environment List option from the server Properties window. In the environment edit properties view you can change the name and description of the environment and define whether Login is enabled for the environment. You can also define whether the specific environment is a Production Environment by checking the provided box. The environment security options enable you to add groups to the environment that are able to perform different functions on the environment as defined within the group specific configuration. 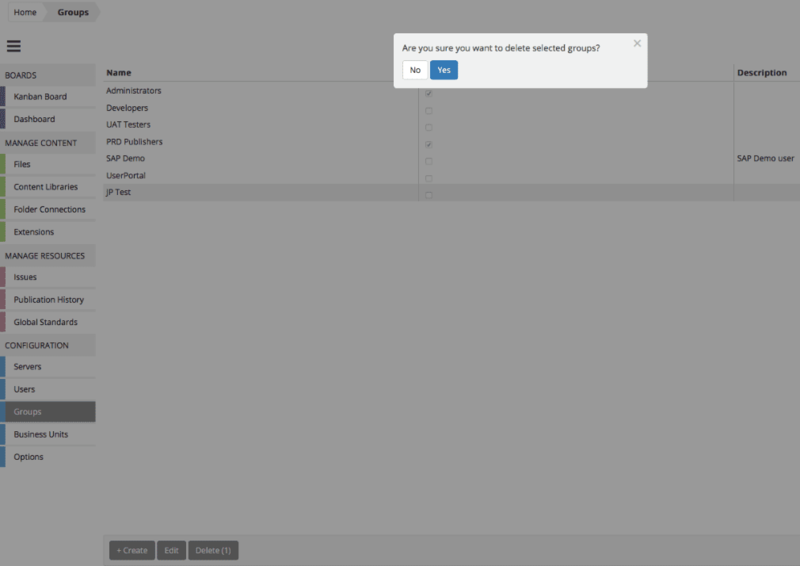 Clicking on Add Group will provide you with an available list of groups that can be added to the specific environment. Select the group and save your selection. Check-Lists are configured per environment. 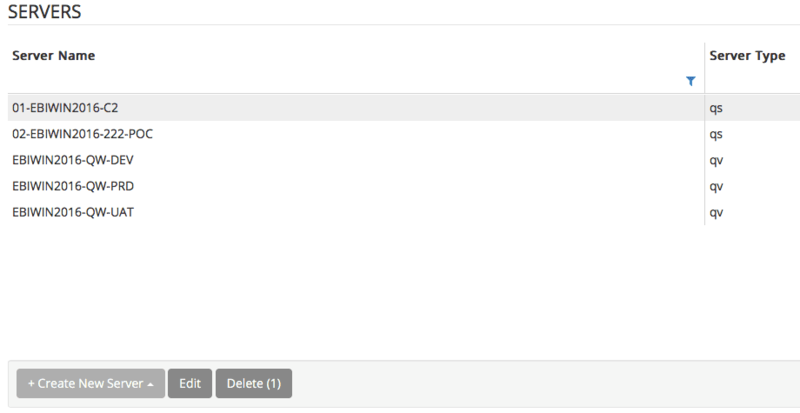 The Admin users can Add Tasks by filling a task name and clicking on the Add Task button. The administrator users can add optional and required tasks that should be checked as validations that the users have conformed to such required tasks before they are able to publish into the environment. Once the field has been created the user can then edit the field, or assign the field as a required field or delete the field from the provided action items. 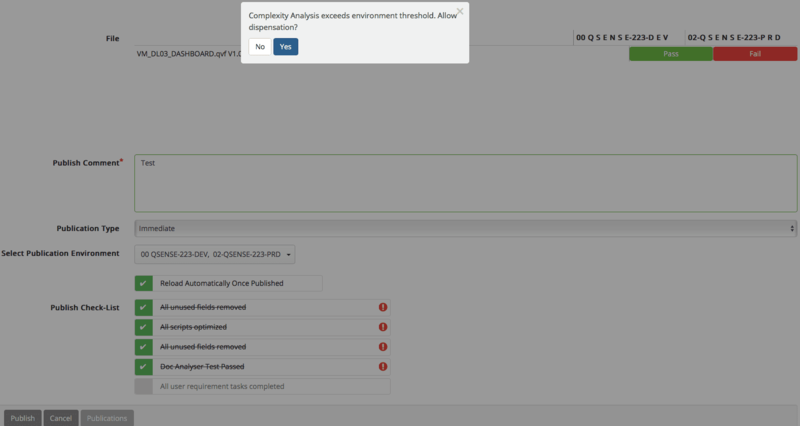 The complexity Analyzer thresholds setup per environment enables you to set up the complexity per environment. You can drag the various categories measured as part of the complexity index (See Complexity Analysis Index) to set the thresholds you wish to apply to the specific environment. When you set the complexity thresholds on an environment any file that does not pass all complexity category thresholds will not be allowed to be published into the environment and would require the user to request dispensation from the administrators, who can then publish the file. When users request access to the system they will require validation from the admin user as assigning a user to the system requires a license. Admin users will receive a notification on their dashboards. Clicking on the user will take the admin to the edit user properties where user rights can be assigned to the user. Alternatively, the admin user can go directly to CONFIGURATION – Users, and check the “Validation Required” box which will display all users waiting for validation. 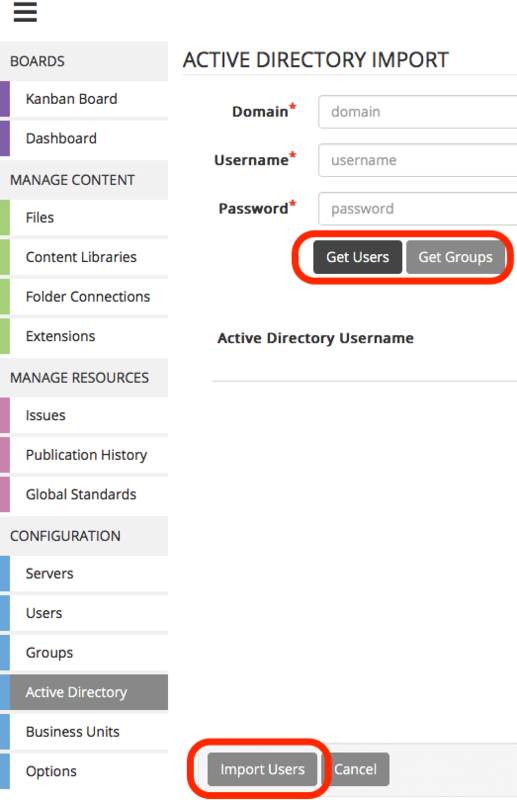 The admin user can now assign user rights to the user which will enable the user account access various system functions and assign the user to user groups. Assigning this right by clicking the checkbox will enable the user to access the User Portal as a business user or analyst. These rights should be applied to users that wish to access and review their own issues on the Kanban board, and interact through collaboration and notification around their issues. Activating this for the user will also provide the user access to their own dashboard where they can track all interactions across all their issues. Please Note: Assigning rights to a user will consume a user license based on the rights assigned. The admin user can also assign an avatar to the user. Users can import their own avatars and images by clicking SELECT TO IMPORT, this will open your file browser where you can browse to the file you wish to import. You will be requested to crop the image to the supported size. Click on Save when done. The image will now display as your current avatar. Users can drag/drop files into the DRAG AND DROP HERE section. You will be requested to crop the image to the supported size. Click on Save when done. The image will now display as your current avatar. 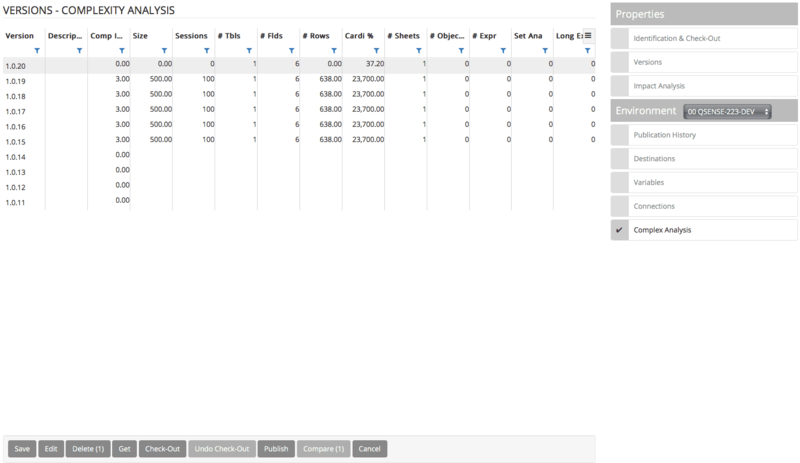 The Client Addon is for QlikView only, it allows users to check out QVW files to their local machine. Each user should install the addon to their own local machine. Download the Client Addon from the link provided on this page, the link will take you to the support website where the setup file is located. Override Client IP – by default the WIP Web Server will automatically identify the WIP Addon client IP. Users can change the Client IP address if it is not correct. Groups are an important configuration for WIP. It is recommended that you always use groups to assign rights to users, meaning that even if you have one user with specific rights that no other user or group of users have, you should still assign that user to a specific group. 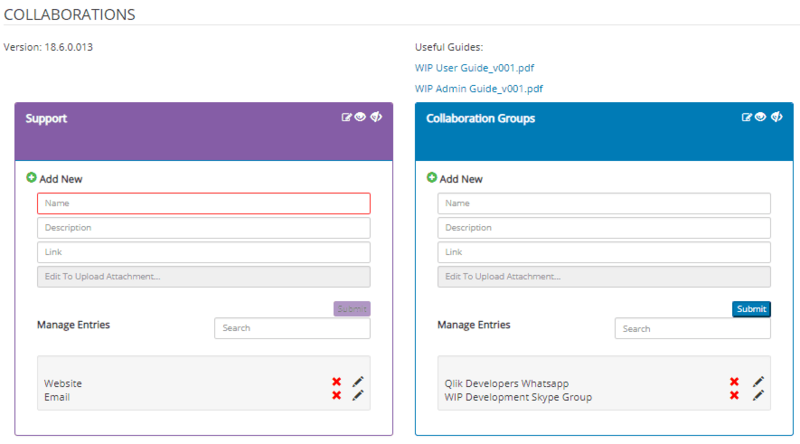 You can assign this group as an administrator group which will enable anybody from the group to access the administration features of WIP. You will receive a list of all the licensed users in the system as Available Users, and you can either click on the “Add All” button, or you can drag users into the Allocated Users area, and drop the user to add the user to the Allocated Users area. Clicking on the Edit button will open the selected group for editing. Editing enables you to change any information about the group such as the name, description and allocated users to the group. Clicking on the Delete button will delete any selected groups. There will be a validation requirement pop up that will require you to confirm you wish to delete the selected group(s). Deleted groups will be permanently deleted from the system and would need to be recreated should you wish the group to exist again. The Active Directory integration configuration option enables the administrator users to define domains and get the domain users and groups automatically synchronized into the WIP user management system. Business Units are an important configuration for WIP. WIP will automatically filter any users lists based on the business unit(s) the users have been assigned to, within the user’s configuration. This configuration makes it easy for users to find their own people within the system. There will always be a default business unit. You can either use this business unit or change the name of the business unit. You can edit existing business units by clicking on the edit button. You can delete existing business units by selecting the business unit(s) in question and clicking on the delete button. This will require a confirmation for deleting the business unit(s) selected. The Options section is where your system wide configuration options are configured. Changing these options will apply changes throughout the system accordingly. The scan level is the level you wish to scan the applications and files when they are checked into the repository. All three scan options will scan all the available options on a file but will provide a more detailed content of the file for comparisons and version content. When you enable this through clicking the check box, you are allowing users to check-in files with exactly the same name. This will mean that instead of WIP managing one master file it will start to manage multiple master files when the file name is the same as the one already in the repository. 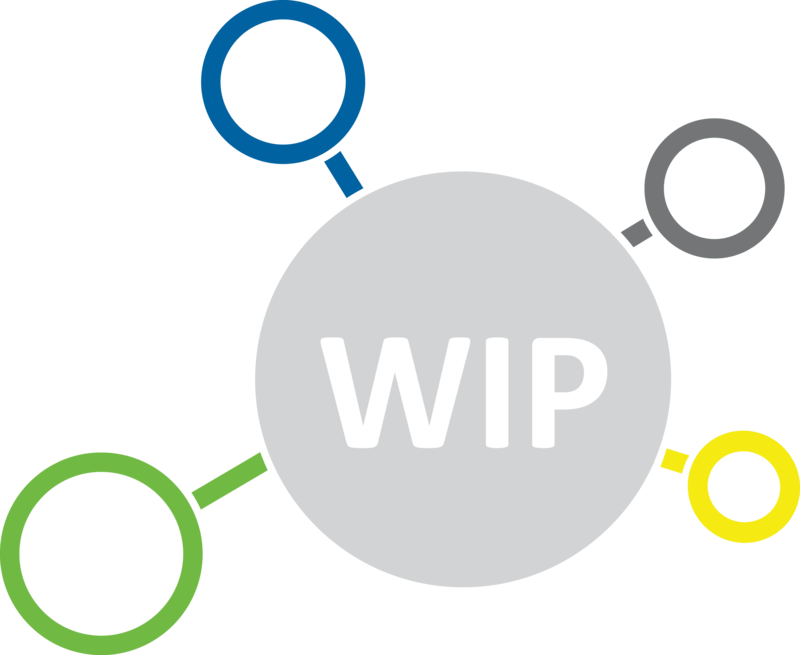 Please Note: Ensure you have a very strict version management structure and policies in place before enabling this on the WIP platform. Collaboration page on the Boards menu allows administrators to provide useful information for users such as support numbers, websites, linked content, chat groups, etc. You can have up to 4 sections on the page with each section customized here. Entries need to be created first before you can upload an attachment to the entry. Once the entry is created click on the edit button for the entry, this will select the entry. Click on “Edit To Upload Attachment”, this will open up the computer explorer where you can choose the file to upload, once selected it is automatically uploaded so no save is needed. This page shows all the possible file extensions that you are able to import into WIP and how WIP will process the file. It is recommended that you leave these configurations as default but should you wish for a file to be processed differently you can configure it here. Double click on “Process As” for the extension to bring up the drop down, select the new extension and click Save at the bottom of the page. The WIP license section enables the administrator user to paste the license code into the license area defined and to save the code. Once saved the license code will unlock the license amounts as have been defined by the code provided to the system. The license code will unlock the Product options and number of licenses per product option. 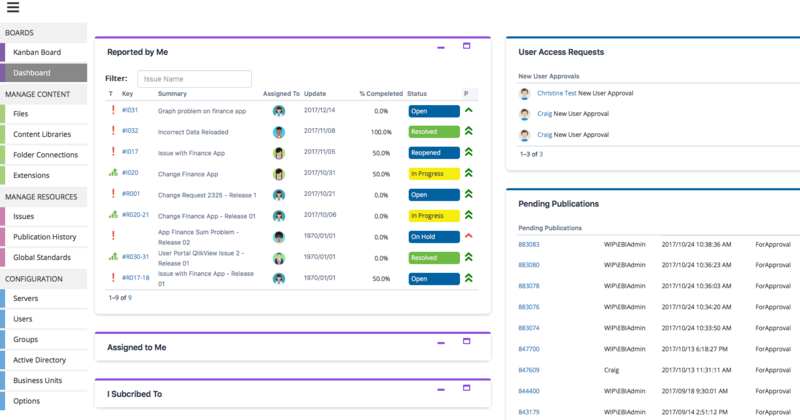 The administrator user can come to the license section to review how many of which product option has been assigned to users throughout the system. The license will also reflect the expiry date of the license. This will inform the administrator user as to when the license should be renewed. 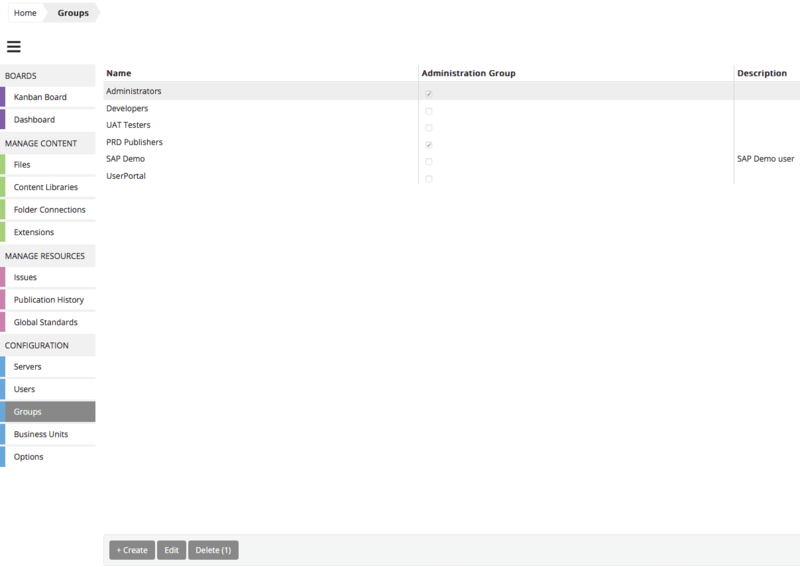 The Kanban configuration options enables the administrator to configure the Kanban board. The administrator can activate various options on the Kanban board according to the available check boxes within the activate columns. Activating these options will display these options on the Kanban board and deactivating them will remove them from the Kanban board this should you not have a To Do area on your current Kanban just deactivate the To Do option by clicking on the checkbox. The email configuration is where you will configure the Simple Mail Transfer Protocol (SMTP) of your WIP server. This will require that you have the necessary configuration information of your company SMTP server and have created a user for WIP to be able to send notifications from the system via email. Ticking this box will enable Secure Socket Layer (SSL) security on the SMTP connection so if you have enabled SSL security on the SMTP server then you will be required to activate this within the WIP service. You can test your SMTP setup by clicking on the validate smtp button. The system will test the configuration and should there not be any errors in the testing it will return a Success comment. Each Qlik Application has a Complexity Index value in the file. The complexity value of a file is a sum of several different measures of complexity of a file’s content, including number of tables, number of fields, number of sheets, objects, expressions, calculated dimensions, etc. WIP users have the option of changing the weighting factor for any of these individual complexity measures as well as setting their thresholds. Applications that exceed the threshold of one or more attributes are probably those whose performance could be improved by reducing their complexity. Their improvement is also likely to benefit the QlikView Server performance by reducing system resource requirements. Base is the level for factoring into the complexity index. If a file contains tables, sheets, or other objects whose counts are below the base settings, then those elements are not calculated in the complexity index. Any number that exceeds the base is used in the complexity index. For example, if the Tables Base is 5, and a file has 6 tables, then 1 would be used to calculate the complexity index. The Max value is used as a divisor in the complexity index calculation, so the higher the Max value, the lower the impact of counts that exceed the Base. The Weight is a multiplier in the complexity index calculation, so the higher the Weight, the greater impact of counts that exceed the Base. 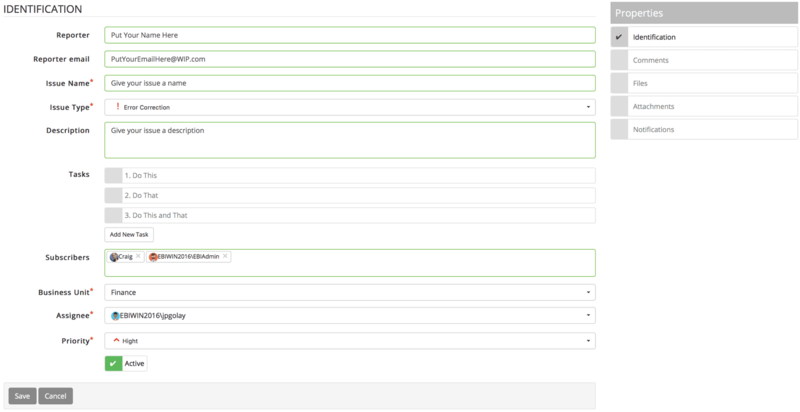 Publish Workflow is on an environment level, it allows Administrators to set up the promotions between environments. All publication users have to follow the promotion path as defined here. Default options means users are able to Publish to any environment, there is no path users need to follow. This is where you set promotions between your environments, with all check boxes un-ticked means that users need to publish versions from DEV – UAT – PRD in that order. This document contains a list of the changes and enhancements that was made to WIP in the different version releases. It will also contain a list of issues that has been fixed in each version. For a more comprehensive list of known issues, please either register on the ebiexperts website (www.ebiexperts.com/register-2) and see the Knowledge Base (click on ‘Help’) section under your profile or refer to the document ‘Restrictions & History’.